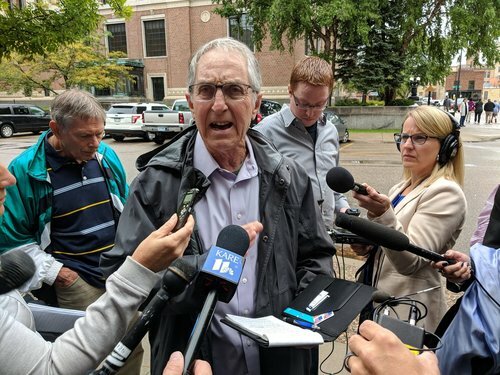 Stearns County is releasing its file from the 27-year investigation of Jacob Wetterling's abduction. Follow this for the latest updates. Gudmundson notes that the investigators from the late 1980s/early 1990s aren't working in the office anymore. Sheriff Gudmundson is done with his presentation, an absolute blasting of how local law enforcement failed on basic tasks after Jacob's abduction and lost control of their investigation. "No question" that state homicide investigators were the best on the team, but they weren't used properly. "It's pretty hard to get a statement out of drunk people:" Gudmondson reiterates why it was so problematic for local cops to make their first arrest of Heinrich while he was drunk. Remember: This crime was 30 years ago, and local cops didn't have modern DNA technology. However, Gudmundson said his department in the late 1980s was solving cases "left and right" without modern DNA tech. Essentially, he's saying lack of technology was no excuse for the botched investigation. Sheriff won't talk about Dan Rassier, who was wrongfully named a person of interest and had his whole life uprooted after being tied to Jacob's disappearance. Rassier has a suit against the county, so Gudmundson won't discuss him due to the active litigation. Dan Rassier, 53, said it ruined his reputation to be wrongly accused in the high-profile case. Big takeaway from the sheriff's presentation: The FBI mishandled the investigation and took on work for which it wasn't qualified. But for now, the FBI files on Jacob's killing are confidential. The public won't get a clear picture of how federal investigators handled Jacob's disappearance. Gudmundson just brought Prince into the picture. He says Minnesota lawmakers need to look at data practices law in light of the investigations into the deaths of Jacob and Prince. Both cases have been under heavy public scrutiny. The sheriff appears to suggest that Minnesota should consider limiting the amount of data that becomes public after a case is closed. The Wetterling family sued to keep confidential documents that were legally to become public. They lost, which is the reason for today's document release. Sheriff says the investigation "went off the rails," starting with Paynesville assaults in 1987. "All of us failed." Local law enforcement lost control of its investigation early on. The FBI took over and things went "off the rails," Sheriff Gudmundson said. Police didn't identify Heinrich quick enough, and botched their first arrest of him. Sheriff and others seem likely push for changes to Minnesota open records law. Sheriff says he has assigned a detective to other unsolved Stearns County cases, including killing of Reker girls in 1974. Gudmundson says other cold cases are getting new reviews, including the 1974 murder of the Reker sisters. Al Garber, the FBI agent who was in charge of the investigation in 1989, has taken the podium. "I was there. I saw it every day." 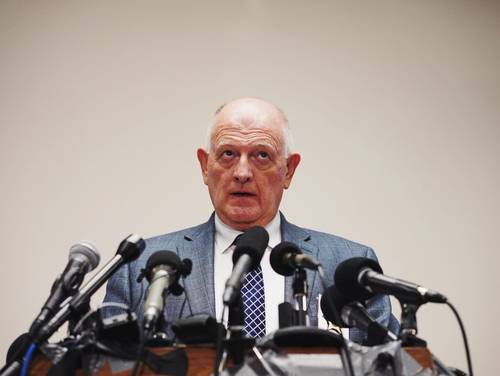 Stearns Country Sheriff Don Gudmundson offered a brutal assessment Thursday of cascading errors and internal friction among law enforcement that let Jacob Wetterling's killer stay free for decades even as the evidence pointed overwhelmingly to Danny Heinrich.